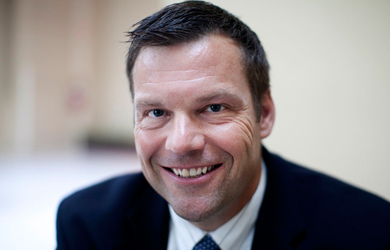 Breitbart’s Ken Klukowski has a dispatch from Kansas Secretary of State Kris Kobach’s latest effort to spread his innovative voter suppression policies around the country. Over the weekend, Kobach spoke at an American Civil Rights Union event at the Republican National Lawyers Association convention in Colorado, where he urged his fellow election officials and lawyers to adopt legislation modeled after a law he helped push through in Kansas. Kansas’ voter ID law is one of the harshest in the country, requiring that those registering to vote produce “proof of citizenship” such as a passport, birth certificate or naturalization papers. Since the law went into effect in 2013, it has been caught up in legal battles as it wreaks havoc with the state’s elections. In May, a federal judge ruled that Kansas couldn’t require people registering using a federal form to produce the burdensome extra documentation. In response, Kobach tried to set up a two-tier voting system in which people who registered using the federal form could only vote in federal elections and would be barred from casting ballots in state and local races. Then, in a last-minute decision, another federal judge ruled that Kobach couldn’t throw out the primary votes of more than 17,000 people who hadn’t produced the extra documentation, including many who had registered using the federal form. The Republican National Lawyers Association (RNLA) held a national election law seminar in Denver on Friday and Saturday, and the American Civil Rights Union (ACRU) convened an invitation-only event alongside RNLA’s seminar, featuring several secretaries of state, chief election officers, Republican former and current federal elections officials, and constitutional lawyers, to explore strategies to protect against voter fraud. Kobach spoke at both events. During the ACRU event, Kobach touted his SAFE Act, which was designed to require proof of U.S. citizenship and proof of identity in a manner fulfilling the requirements the U.S. Supreme Court has held are consistent with the Constitution. It is model legislation for states to adopt as part of their election laws, rather than a federal law, since the Constitution entrusts the sovereign states with primary responsibility for holding elections. “Every state needs to address it and take steps to secure the most fundamental privilege of citizenship—the vote,” he added. Kobach, who also specializes in draconian anti-immigrant legislation, acts like something of a one-man American Legislative Exchange Council (ALEC), the group that helps spread conservative and corporate-friendly laws to state legislatures. In fact, Kobach responded on his weekly radio program last month to a critic who called him an “ALEC pawn,” saying that he is the one who is trying to get ALEC to spread voter restrictions across the country.